Wrought iron accents are a great way to tie a charcoal or black roof in with your landscape design. 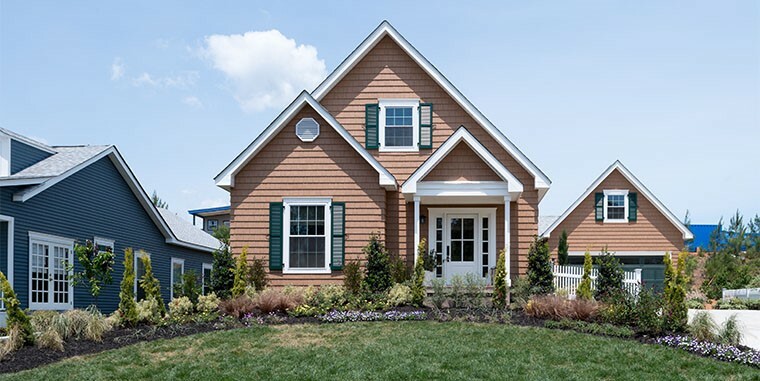 Coordinating your landscaping to match your home’s siding and roofing is a great way to create an overall polished look. Putting in a little extra effort to make everything look like it belongs together, no matter your style in landscaping, is important to creating a look that is pleasing. 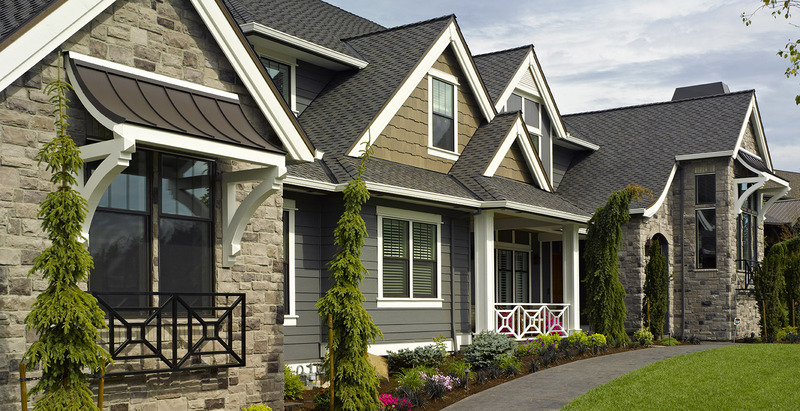 Check out the following best landscaping elements to match your home’s exterior color. Many homeowners choose a brick-colored roof for their home, which is a great option for homes that have a warm siding color. Carry the look of brick all the way throughout your yard by adding brick accents. Some ways to use brick accents in your yard include a retaining wall or a brick barbecue pit can serve as a beautiful focal point in the backyard. Another great option is to use brick to make a permanent mailbox stand that will coordinate well with the overall look of your home. If your home has a darker roof or paint color, such as dark gray, try using wrought iron in your landscape to help tie the colors together. Wrought iron is great to use for railings along steps and porches. It can also be used to make decorative yard pieces like standalone solar light stands and plant holders. Choose a twisted style of wrought iron to create even more depth and interest to your yard along with elements of movement as well. Ornamental grasses in brown and green provide texture and color to a homes in a warm color family. There are many different varieties of plants that will naturally complement your exterior color choice. If your home has a white, cream or tan color palette consider choosing pops of color like bushes and trees that bloom shades of red, orange or bright pink. Homes with a blue or grey exterior color could add bright flowers that bloom yellow in order to accentuate the overall look of the home. A home with brick or red siding looks nice surrounded by ornamental grasses that turn shades of tan or brown in the fall. Green colored plants will always complement any exterior color but there are many choices if homeowners want to get more specific with other plant color options. You can also consider xeriscape landscaping, using native plant varieties and eco-friendly options to create a modern look that will complement any exterior, or a roof with solar panels in particular. Consider planting a few different varieties that will bloom at different times during the year in order to have something in the garden that is always complementing the home’s overall look. Here a stone pathway draws the eye through the carefully landscaped yard to the home’s show stopping stone work. There are many different colors of stone that will complement lighter exterior colors. Consider adding light gray or white stone to your garden beds in order to continue a lighter color design throughout your yard. Homeowners can customize stone depending on their needs and space available. Some homeowners may want to use flagstone pavers to create a walkway while other homeowners may only have room in their yard for the addition of white pebbles underneath flowerbeds. There are even options of lava rock that are a brown and red hue that would match warmer colored roofing and siding as well. Choosing landscape design elements that match the exterior color of a home is easy considering the many options available. Consider using stained wood for a natural and customized option or wrought iron for roofs and siding of darker shades. Red or brown hued exteriors can use landscape elements such as brick and plants to complement the warm overall color. Siding and roofs with lighter shades of gray or tan can easily be matched with different varieties of stone to complete a polished look. Consider these landscaping elements when trying to match your home’s exterior color and overall appearance. Looking for more ideas? 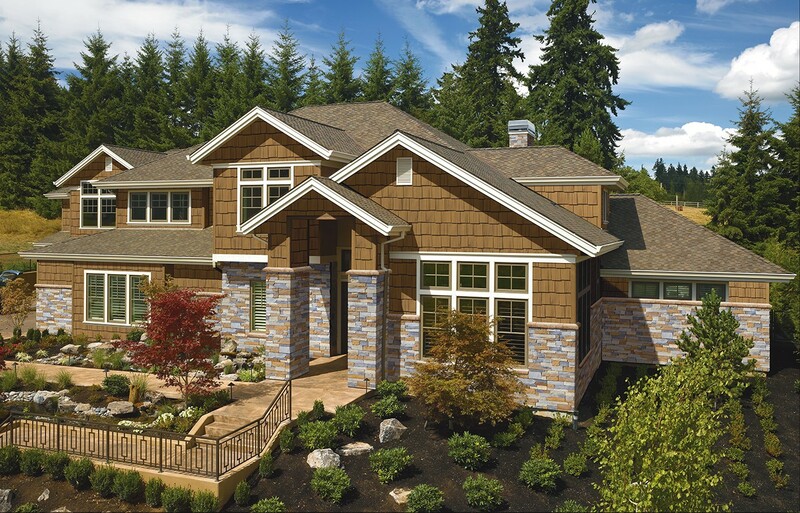 We have product experts offer their seven tips to inspire your exterior renovation. Plus, see it before you build it. These six free design tools will help you plan. Or better yet, get them delivered right to your inbox with our monthly newsletter! Sign up now! Kristina Phelan is a garden and landscape writer, and her parenting column, Mama Bear Moxie, is printed in a few newspapers across the country. She lives on a farm in the Midwest with her husband, three kiddos, and too many animals.